On October 26. 1993, the North Shore Daylight Lodge in Beverly held its first formal Installation of Officers. Wor. Sheldon Pruss was installed as Master; Wor. Malcolm Rogers as Senior Warden; and Wor. Irving Shapiro as Junior Warden. The Installing Suite included for presiding District Deputy Grand Masters from the North Shore. Sixteen District Deputy Grand Masters were in attendance. The installing team were all members of the Association. The Lodge meets on the fourth Tuesday of the month at 10:00 A.M. at 20 Washington Street, Beverly. A lunch is served after each meeting. Wor. Irving Shapiro, Junior Warden; Wor. 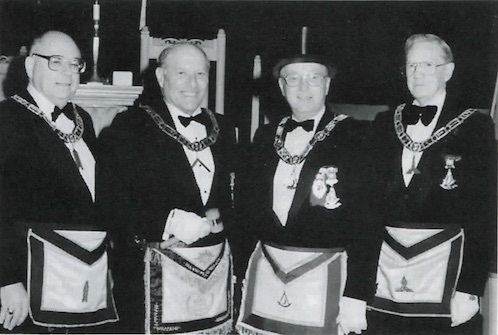 Sheldon Pruss, Master; R. W. Robert W. Moore, D. D. G. M., Lynn 8th District; and Wor. Malcolm H. Rogers, Senior Warden. First row: R. W. John A. Duncan; R. W. R. L. Spinney; R. W. Warren R. Davis, P. J. G. W.; R. W. Willis Quimby, D.D.G.M., Salem 8th District; R.W. Robert W. Moore, D. D. G. M., Lynn 8th District; R. W. Harry C. Holman, D. D. G. M., Lawrence 11th District; R. W. A. Neil Gadd, D. D. G. M., Newburyport 10th District; and R. W. Thomas White, Jr.
Second row: R. W. Walter Ray; R. W. Alfred E. Grimm; R. W. Philip Pergola, Jr.; R.W. Harry Dill; and R. W. Thomas Todd, Jr.
Forty-six charter members of North Shore Daylight Lodge proudly stood in double file to welcome M. W. David W. Lovering. Grand Master, and his suite as they entered the Beverly Masonic Temple on Tuesday, September r30, 1993, to constitute the Lodge. The Lodge had held its first meeting on October 27. 1992. when it was instuted with M. W. Edgar W. Darling presiding. All Officers had been elected or appointed by November 24, 1992, and the following month they conferred the Entered Apprentice Degree on a Candidate from Amity Lodge as a courtesy. R.W. Robert W. Moore, D. D. G. M. Lynn 8th District, made hi first Fraternal Visit on March 23, 1993. So. in eleven months the North Shore Daylight Lodge has come from fledgling to full maturity. The charter members have reason to be proud. After presentation of the Charter by the Grand Master to Wor. Robert W. Walters, expressions of pleasure and appreciation were extended by R. W. Carl A. Gordon, Deputy Grand Master: R. W. John W. Hanson, Senior Grand Warden; R. W. James A. Vytal, Acting Junior Grand Warden; M. W. Edgar W. Darling; R. W. Robert W. Moore, D. D. G. M. Lynn 8th District: and Wor. Robert W. Walters. M. W. David W. Lovering. Grand Master, then added his own comments and closed the Lodge. Thirty-seven visitors were present as well as the 20 members of the Suite and the 46 charter members. Also on the Suite were M. W. Stanley F. Maxwell, P. G. M.; M. W. Arthur H. Melanson, P. G. M.; M. W. Albert T. Ames, P. G. M.; R. W. Warren R. Davis, P. J. G. W.; R.W. Willis F. Quimby, Jr., D. D. G .M. Salem 8th District: R. W. Wesley C. Tucker, D. D. G. M. Gloucester 9th District; R. W. A. Neil Gadd, D. D. G. M. Newburyport 10th District; R. W. Harry C. Holman, D. D. G. M. Lawrence 11th District; Wor. John R. S. Higgins, Grand Chaplain; R. W. Robert Johnston, Grand Lecturer, Acting Grand Secretary: Wor. William P. Renny, Jr., Acting Grand Sword Bearer; Wor. Steve J. Gogolos. Senior Grand Steward; Wor. Herbert F. Johnson, Acting Grand Tyler: and R. W. E. Joel Peterson, Grand Marshal. The North Shore Daylight Lodge was a dream of Wor. Robert W. Walters, Past Master of Starr King Lodge of Salem. With the assistance of R. W. Thomas B. White, Jr., D. D. G. M. Salem 8th District, he started signing up charter members. By September 1, 1992. they had received dispensation from Grand Lodge, and Wor. Bro. Walters was named Master. Wor. Sheldon Pruss of Jordan Lodge was appointed Senior Warden and Wor. Herbert Simpson of Amity Lodge as Junior Warden. By October 27, 1992, 50 Master Masons were listed as members. This page was last modified on 28 December 2017, at 10:09. This page has been accessed 8,209 times.